The kids I care for love everything lemon. 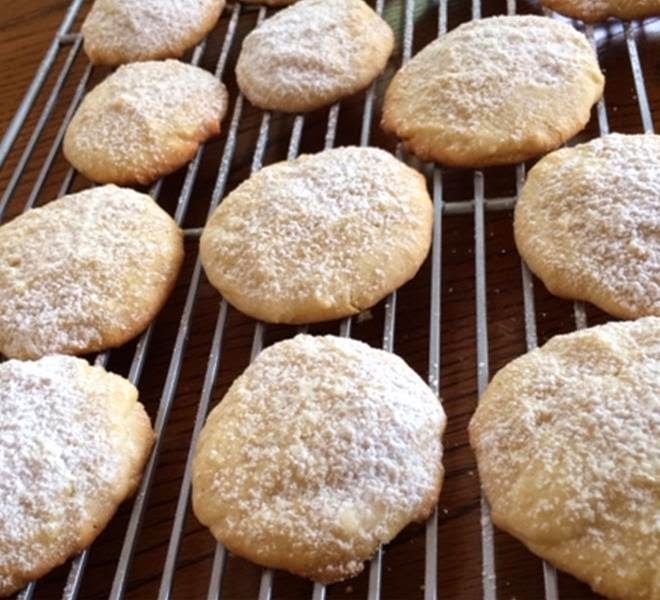 Since we bought way too many lemons to make lemonade last week we decided to bake some lemon cookies. An important tip is not to soften the butter in the microwave or oven or the cookies won’t rise. Just be patient and let the butter soften on the kitchen counter until room temperature. 2. Beat butter and sugar in a large bowl with electric mixer on high speed until fluffy. Beat in remaining ingredients except flour until well blended. 3. On low speed, beat in flour just until blended. 4. Drop by rounded teaspoonfuls 1 1/2 inches apart on ungreased cookie sheets. Sprinkle with sugar or almonds. 5. Bake 10 to 12 minutes until edges are lightly browned. Cool on cookie sheet 1 minute before removing to wire rack to cool completely. 6. Sprinkle with a few tablespoons of powdered sugar before serving. Store in an airtight container at room temperature for up to one week.